What a terrible loss. The Pittsburgh Penguins had an opportunity to control whether or not they would earn second place in the division and home-ice advantage for the first round. They will now need to win out and hope for help from the Florida Panthers and the Washington Capitals who will have nothing to play for in their final game. The Penguins lost to a team with one NHL line last night. They allowed the players on that line to beat them. Tyler Bertuzzi finished with two goals as did Anthony Mantha. Dylan Larkin added three assists. The rest of the Red Wings lineup looked as if an NHL19 player generator hooked up with a 3D printer. Pittsburgh had four high danger shot attempts. 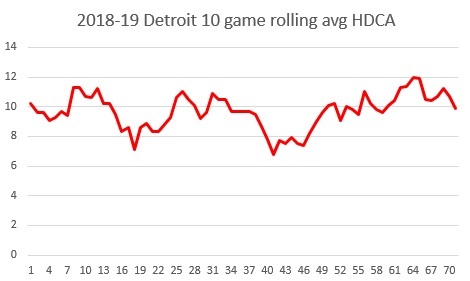 The Red Wings allow around ten on average. Mike Sullivan did the right thing by matching Sidney Crosby up against Detroit’s only good line. Pittsburgh has better forward depth and it should have been able to outplay the other Detroit lines. Sullivan undercut his strategy by putting Pittsburgh’s worst pairing with the top line and was never willing to budge from it the entire game. You would like to see the coach play chess instead of checkers, but here we are. One side effect of using an incapable pair against the tougher matchups is that other pairings can breath a little. Overall the Pettersson-Gudbranson duo rebounded and had a favorable shot share. One issue teams can expose with them is their lack of foot speed and the Red Wings did just that on the third goal. Mantha blew by Pettersson on a Murphy Dump and scored the insurance goal for Detroit. It is what the Penguins used to do to teams during their 2016 run. There’s no excuse for losing this game. Even with Pittsburgh’s injuries the lineups aren’t comparable. The good news is just because you play a crappy game doesn’t mean you are a crappy team. The loss doesn’t have to come with a carryover effect. The team is very capable of taking the final four points of the season. The biggest news to watch for today is what are Evgeni Malkin and Kris Letang doing at practice. If they are full participants then we very well could see them suit up against Detroit on Thursday. If not we are down to one final game before the regular season. As for Brian Dumoulin his injury is not serious. He would have probably been in the lineup if it was a playoff game.